This sander's big 25" x 25" table makes cabinet doors and other large projects a breeze to edge sand - and the wide variety of interchangeable spindles turn custom work into "child's" play. 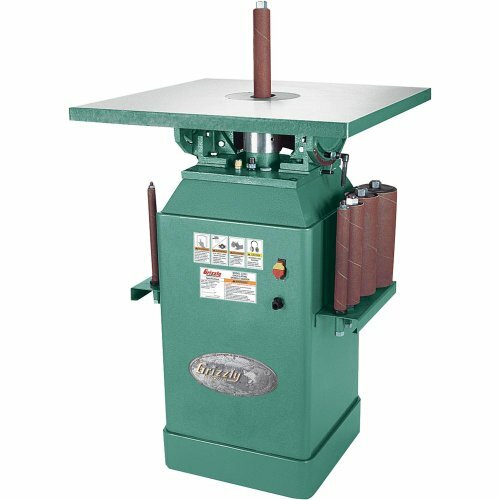 Our spindle sander will satisfy the needs of both the professional and serious hobbyist. We back this up with our warranty parts and service. CSA certified meeting CSA C22.2 -71.2-08 and UL 987-7th standards. Features: • Motor: Heavy-duty 1 HP 120V/240V single-phase 12A/6A prewired 120V • 25" x 25" cast iron table tilts to 45-Degree left 15-Degree right • Ten spindle sizes: 1/4" x 5" 3/8" x 6" 1/2" x 6" 5/8" x 6" 3/4" x 9" 1" x 9" 1-1/2" x 9" 2" x 9" 3" x 9" 4" x 9" tapered and threaded • Floor to table height: 35-1/2" • 1725 RPM spindle speed • Includes formed and welded steel stand • Spindle oscillates at 72 strokes-per-minute • Stroke length: 1-1/2" • Built-in 4" dust collection port • Lubricated-for-life ball bearings • Features ground steel table inserts and 100 grit sleeve for each spindle • Powder coated paint • CSA certified • Approximate shipping weight: 296-Pound.